Reading: Goodnight, Moon. I have been reading it to my son all day today. What can I say? It’s a classic. Watching: Bridesmaids. A healthy dose of Kristen Wiig and Maya Rudolph with a smattering of (a mostly naked) Jon Hamm makes for a very entertaining watch indeed. Listening to: Hold On by Wilson Phillips. If any of you have watched Bridesmaids, you will understand why. It was one of my favourite songs back in the day. I know the painnnn…. Come to think of it, the opening shots of the music video with the mountains and the trees reminds me of Edward Cullen flying through the forest in Twilight. I am actually thinking of Edward Cullen right now. That is perturbing indeed. Wondering: Since I am in such a reflective mood today, whatever happened to K-Fed? Clearly, not much has changed. But I reckon I need to change…must stop Googling has-been celebrity types. NOW. 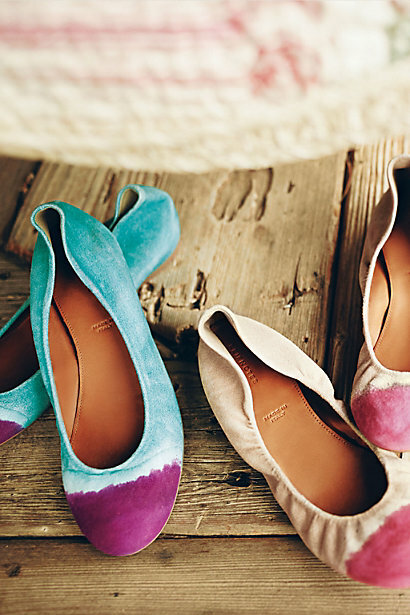 Wanting: These beautiful hand-painted Taika flats from Anthropologie. I love how the colours bleed into each other. « I Went A Little Overboard. Hence, Sapodilla Pudding. and also I have to agree on Bridesmates.. my favorite scene was when they were in the fitting room getting fitted for their dresses. LOL. HILARIOUS.. I couldn’t contain myself. Oh that scene is hilarious!!! It was a really fun movie. Those shoes are pretty great, aren’t they? Love the movie Bridesmaids! Hilarious. I liked it better than The Hangover II. I have not seen The Hangover 2, but it is on my list! I am completely with you on Jon Hamm. Holy moly he’s fantastic! You betcha!! I maintain that when it comes to Don Draper…the more complicated he gets, the hotter get becomes! Weird theory I know. I adore the Hamm. Dang I love those shoes!!! I love most of the goodies from that store…sigh..
Anthropologie is very hard to dislike. You just can’t!! You know, it is your appreciation that makes it more fun! Wilson Phillips rocks. It’s such a sista song. Love those ballet flats! Do they have a store in India? No 😦 And I’m not sure whether they have international shipping either!! I wish they did those shoes as heels – they are gorge! Ooh yes they would be delightful as wedges too! !